10 free Frosty's from Wendy's for a $1 donation? Sound too good to be true. Maybe so, but Justin Hazen says it worked at his local Wendy's. 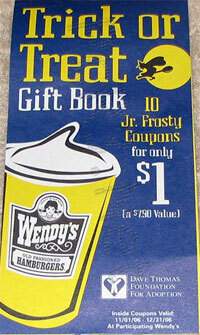 According to Justin's blog, when you're purchasing a meal at Wendy's and you're asked if you'd like to donate to their charity, fork over a $1 and they'll give you the coupon book (shown here) good for 10 free Jr. Frostys. I haven't tried it yet, but if you have luck (or don't) let us know about it in the comment section. By the way, the charity your dollar will be going to is the adoption foundation created by Wendy's founder Dave Thomas, the Dave Thomas Adoption Foundation. Dave himself was adopted and was a fervent spokesperson for adoption during his lifetime. They do this every year. They are really small, however. I just saw a commercial, it's no secret, the want you to do it! how can it be a $750 value if you only get $1 off a JR. frosty? No you pay 1 dollar and get coupons for 10 jr frostys valued at 89 cents each. Do it the right way. 100% of your donation goes tothe charity. The company does not profit at all. If you want a bigger frosty, combine your coupons. 1 is good for a 6 oz. you shouldn't have a problem getting a sm 12 oz. for 2 coupons, a med, for 3 coupons, or a lg for 4 coupons. vanilla or chocolate. Even if you don't like frostys, It's worth helping local foster children find homes. does anybody know why they closed down the wendys downtown waukegan it always seemes busy there. OMG it is not a scam. This is a yearly event. It is going to happen again this month. You can get any flavor Frosty. Also the value of each coupon inside the booklet is 89 cents. So... if you want a larger one they are supposed to take 89 off the price of the larger frosty. I am a GM in columbus @ wendy's!